With First Class tickets sometimes costing almost double the price of a Business Class flight, you might find yourself wondering: what’s the difference? We all know First Class is the most luxurious way to fly but what do you actually get for your money? Usually you’ll receive added perks like separate lounges, fancier champagne, complimentary PJs and chauffeur driven limousines, however things do vary from airline to airline, so we decided to compare First Class and Business Class on three of the top international airlines. Business Class customers with Singapore Airlines get a 40kg baggage allowance, while Suites & First Class customers are allowed 50kg. If you’re flying in Business Class you’ll check-in at one of the many Business Class counters as normal, whereas in First you’ll check in at the First Class Check-in Reception. Upon arrival a porter unloads your baggage and a Passenger Relations Officer handles the check-in process. A private entrance from the lounge leads directly to immigration, after which you can proceed to the SilverKris Lounge or to your boarding gate. 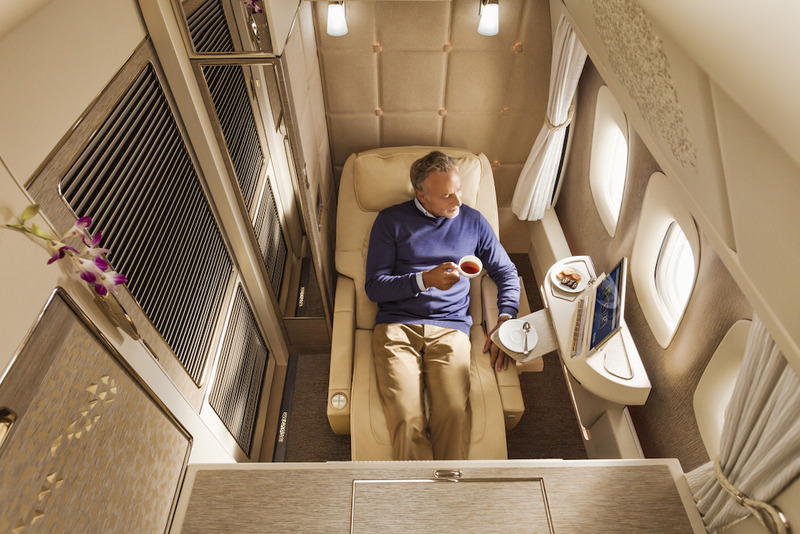 Singapore Airlines offers Business Class, First Class and “Suites” – so three levels of premium cabins. Business Class on Singapore Airlines is quite the experience, with seats that are among some of the largest and widest in the skies. You really can’t go wrong with Business Class and First Class seats are just a bit wider with more privacy. Suites, however, are some next level stuff. 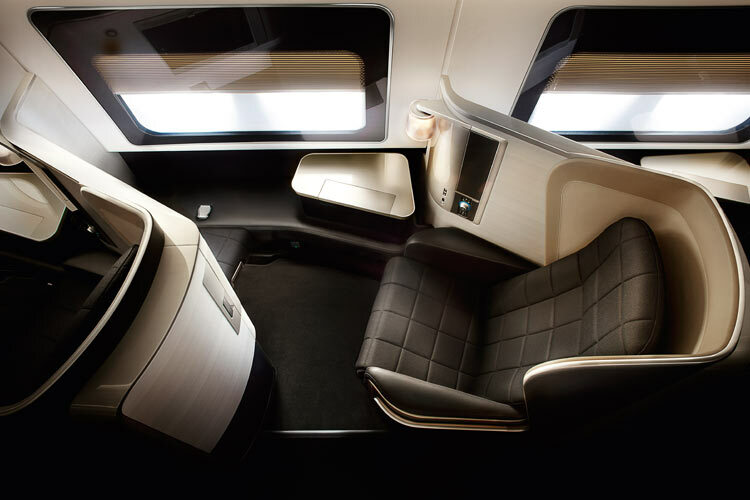 Singapore Airlines recently unveiled its new A380 suites, which feature a standalone bed and a swivelling leather chair by Poltrona Frau. If you’re travelling with a loved one, you can choose the double suites, where the centre divider between rooms can retracted to make way for a double bed. Add to that a sliding door, a personal wardrobe and a 32″ entertainment screen and you really do feel like you have your own private room/cinema in the sky. Best of all, things like lighting and service can be controlled using a handheld tablet. 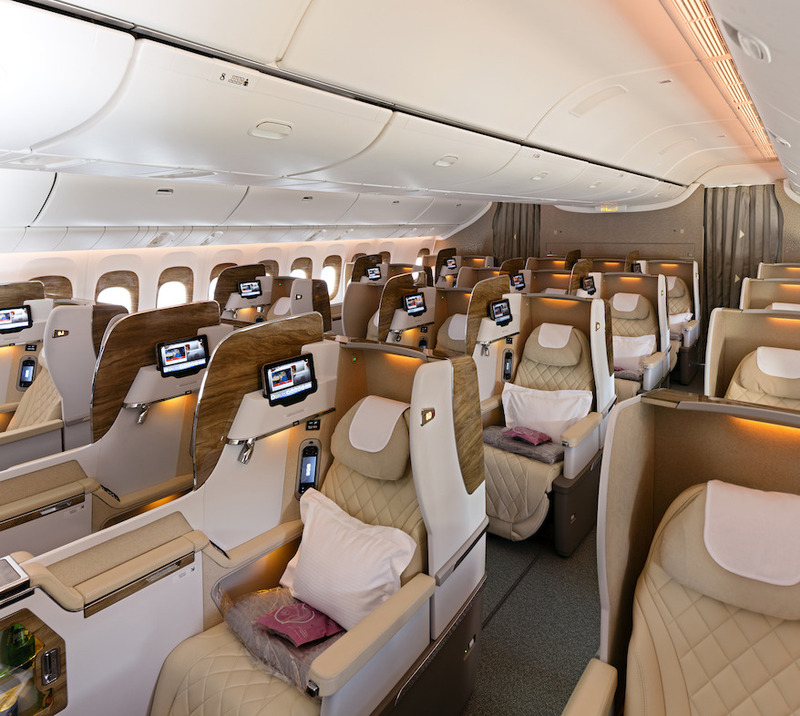 Business Class seats on the new A380 aren’t fully enclosed like Suites are, but they do offer exceptional privacy. Centre seats feature a privacy divider that can be lowered to create a double bed – great for couples. Each seat has an 18″ entertainment screen and multiple stowage compartments for storing your belongings. When it comes to dining, you can pre-order your meal using the airline’s “Book the Cook” service whether you’re travelling in Suites, First Class or Business Class. The main difference between the menus is that the food is more decadent and the menu more extensive in First Class, but meals in both cabins are excellent. Food in First Class is served on bone china tableware from Wedgwood , which a personal dining table dressed with crisp linen. 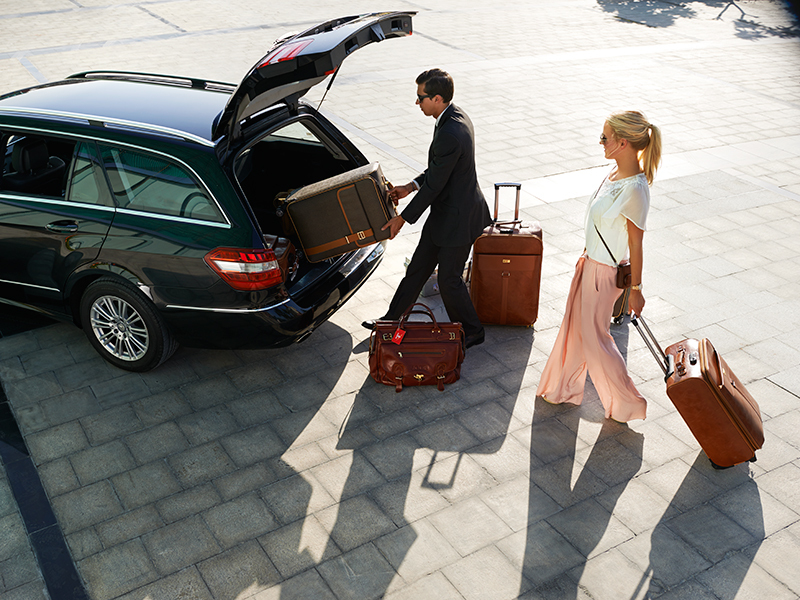 Emirates offers a complimentary chauffeur-drive service for both First and Business Class customers so you can be picked up or dropped off at the airport in style. Business Class customers in Dubai are driven around in a BMW 520i Touring and if you’re travelling in First Class you can enjoy free in-car Wi-Fi to catch up on emails, browse your social feeds or send a message. In most airports Emirates doesn’t have separate First and Business Class lounges, so you’ll have the same experience no matter what class you’re travelling in. 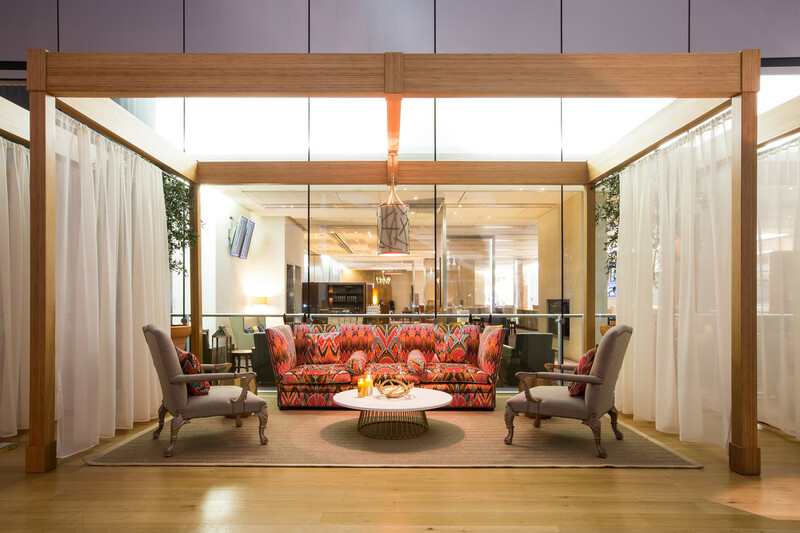 In Dubai though you will find separate lounges – the First Class lounge has a la carte dining, while the Business Class lounge has a buffet-style service. If you’re flying on the A380, then in First Class you can take a shower in the onboard shower spas, whereas in Business Class you can’t. The shower spas are stocked with a selection of Bvlgari toiletries and signature Timeless Spa products, so you can take a shower and pamper yourself before landing. 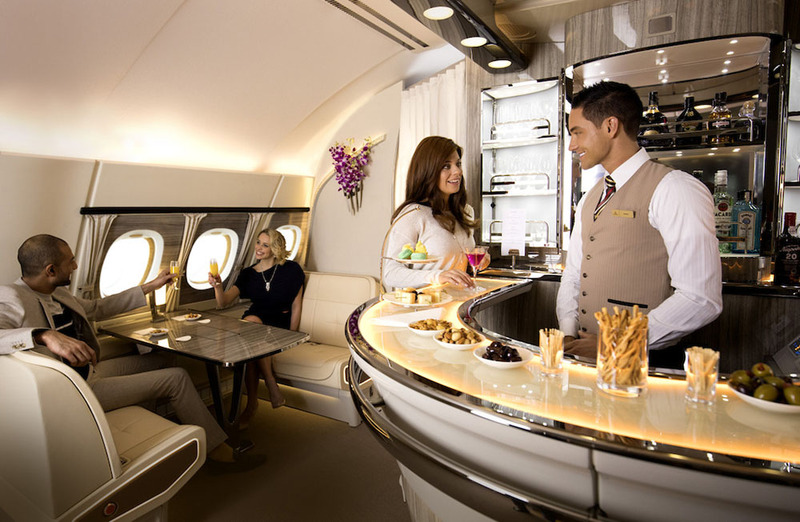 Both cabin classes, however, have access to the onboard lounge, which features a staffed bar serving cocktails and canapés, as well as a 55-inch TV. Emirates’s game-changing 777 First Class suites are incredible and are designed to look like the interior of a Mercedes-Benz S-Class. 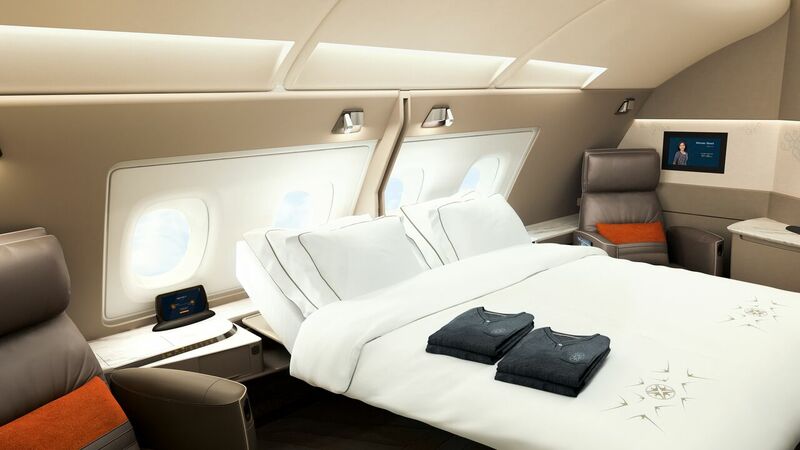 The suites are fully enclosed with cream leather seats, temperature controls and mood lighting, plus the centre suites have the world’s first “virtual windows” so that every passenger has a view of the sky. The entertainment screen measures 32-inches and the seat has a “zero gravity”position, which is meant to give a feeling of relaxation and weightlessness. In Business Class on the new 777 you don’t get the fully enclosed suites – instead you have a privacy divider separating you and the person sitting next to you. The seats are, however, designed to resemble the seats of a sports car, with a diamond stitch pattern on the full leather cover. Each seat has a personal mini bar and a 23-inch entertainment screen, which is smaller than those found in First Class. It’s still very swanky but doesn’t offer all the novelties of First Class. In First Class you have the added perk of moisturising pyjamas, which gently release naturally nutrient rich sea kelp as you move around, preventing dehydration and stimulating circulation. Bedding in both cabin classes is very plush, although First Class has exclusive sheep-skin-like blankets. Both the First Class and Business Class amenity kits are designed by Bvlgari, although the First Class kits have a leather feel and touch, while the Business Class kits are made of fabric. The food onboard isn’t hugely different between First and Business Class, although you do get a caviar course in First Class, as well as vintage 2009 Dom Pérignon champagne. In Business Class the champagne is Veuve Clicquot. When flying in First Class from Heathrow you have access to BA’s First Wing – a dedicated space that offers a private check-in area with two exclusive security lanes and a direct walkway that leads into the Galleries First Lounge and then the Concorde Room. The Concorde Room is the airline’s most glamorous lounge, featuring the best of British design and intimate booths with waiter service. In Business Class you’ll only have access to the Galleries lounges, which are nice with plenty of seating and buffet-style food, but not as luxurious as the First Lounges. A Business Class ticket offers fast-track through security but you’ll still have to make your way through the airport to the lounges. As a First Class customer you also have access to “You First”, a helpdesk service with a dedicated phone number exclusively First customers. This is something that isn’t available for Club World customers. First Class suites are much larger, with more storage, extra privacy and direct aisle access at every seat. They also have larger TV screens that measure 15 inches (or larger on the Dreamliner) compared to the 10.5 inch screens in Business Class. 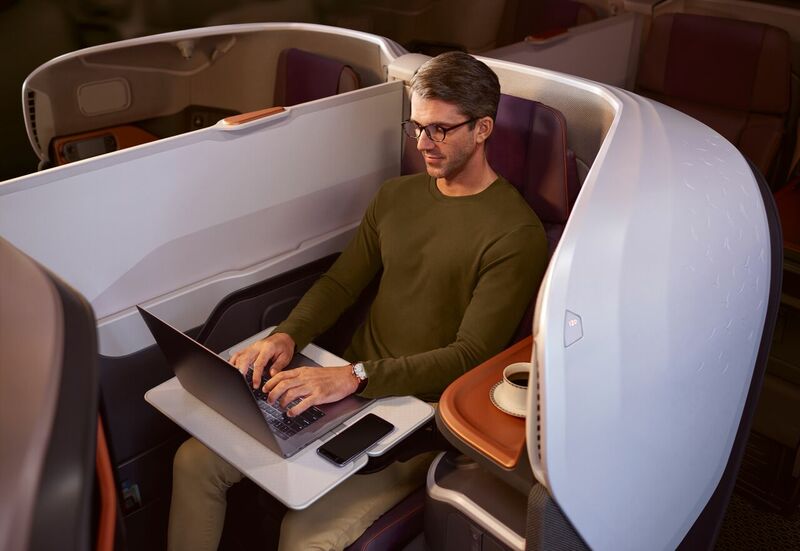 Both cabin classes feature lie-flat seats but the Business Class cabin still has a 2-2-2 layout, which means only aisle seats have direct aisle access. One thing we will say though is that British Airways has invested a lot of money into improving its Club World product, including the bedding. In First Class you get a luxurious quilted mattress, crisp white cotton duvet and pillow but Club World now has luxurious new bedding from The White Company, including an elegant day cushion, a luxuriously soft large pillow, a super-soft woven day blanket with satin trim and a specially developed luxurious duvet. One thing you don’t get in Business Class is pyjamas – these are available in First but not in Business Class. So if you choose Business Class and like to be able to slip into a pair of PJs, you’d have to bring your own. Finally, let’s talk about the amenity kits. The First Class amenity kit is exclusively designed by Liberty London and contains selected Aromatherapy Associates essentials. 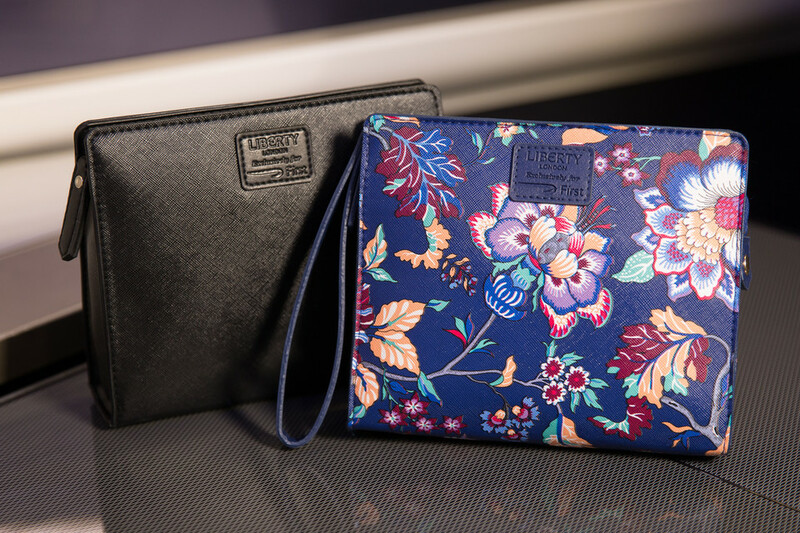 It’s a nice looking bag with patterned designs from the Liberty London archives. The Club World amenity kit is designed by The White Company and is still a great kit, featuring a jersey eye mask and products from the retailer’s Restore & Relax Spa Collection. When it comes to First Class vs Business Class, the main thing to do is weigh up your budget and what you feel is worth it to you. At SkyClub.com we have special deals with the major airlines that allow us to provide heavily discounted First Class tickets and sometimes even free upgrades to First, so it’s always a good idea to give us a call on 0207 255 1234 to see what we can do for you.